Statistical Thermodynamics Daily John W.
Add to cart the livre of Daily John W.
Statistical Thermodynamics: An Engineering Approach covers in a practical, readily understandable manner the underlying meaning of entropy, temperature and other thermodynamic concepts, the foundations of quantum mechanics, and the physical basis of gas, liquid and solid phase properties. It presents simply the relationship between macroscopic and microscopic thermodynamics. In addition, the molecular basis of transport phenomena and chemical kinetics are explored as are basic concepts in spectroscopy. Modern computational tools for solving thermodynamic problems are explored, and the student is assured that he or she will gain knowledge of practical usefulness. 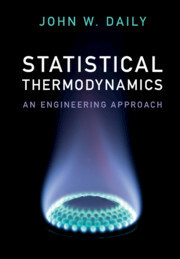 This essential text is suitable for mechanical or aerospace engineering graduate students who have a strong background in engineering thermodynamics, those entering advanced fields such as combustion, high temperature gas dynamics, environmental sciences, or materials processing and those who wish to build a background for understanding advanced experimental diagnostic techniques in these or similar fields. 1. Introduction; 2. Fundamentals of macroscopic thermodynamics; 3. Microscopic thermodynamics; 4. Quantum mechanics; 5. Ideal gases; 6. Ideal gas mixtures; 7. The photon and electron gases; 8. Dense gases; 9. Liquids; 10. Crystalline solids; 11. Thermodynamic stability and phase change; 12. Kinetic theory of gases; 13. Spectroscopy; 14. Chemical kinetics. John Daily is currently a Professor of Mechanical Engineering and Director of the Center for Combustion and Environmental Research at the University of Colorado Boulder and previously was a faculty member at University of California, Berkeley. He is a Fellow of The American Institute of Aeronautics and Astronautics (AIAA) and serves on the AIAA Executive Publications Committee. He has regular contributor to the AIAA Journal, the Combustion Institute Journal and the ASME Heat Transfer Journal. He teaches both undergraduate and graduate courses in the thermal-sciences, including thermodynamics. He is a founder of Precision Biopsy, LLC., a company that is developing optical biopsy instrumentation for cancer detection.